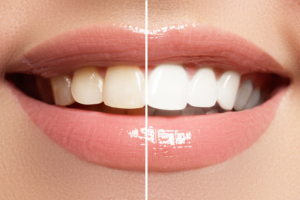 KöR Teeth Whitening is a refrigerated gel and tray system. The gels require extensive time to diffuse into the microstructures on the teeth. However, because of continuous contamination by saliva, most gels are only diffusing through the teeth for half an hour. Whereas, KöR Whitening gels seal out saliva which makes them most effective. These whitening trays are designed to rejuvenate the enamel. In addition, proper dental care offers long-term results and whiter teeth. Book an appointment today. Call (978) 537-8566 or book online. Moreover, we proudly accept new patients and most insurances.